​2016 has just begun and the NME already struck back. On Friday January 15th the members of the ensemble joined their forces to take part in the prestigious Zealous X, a 10-day intensive festival at Rich Mix, Shoreditch. Committed to the sundry scene of London creative realities, the festival gathers together the most interesting experimental projects and new voices in town. It calls upon underground collectives as well as more polished works by established artists. The programme scheduled a variety of events ranging from music and performance art to talks, debates and movies. The NME were shortlisted for the performance art category, a choice accounting to the collective’s ethos of employing sounds as means for unusual participatory strategies that hinge on, yet aren’t reducible to, the social notion of music. 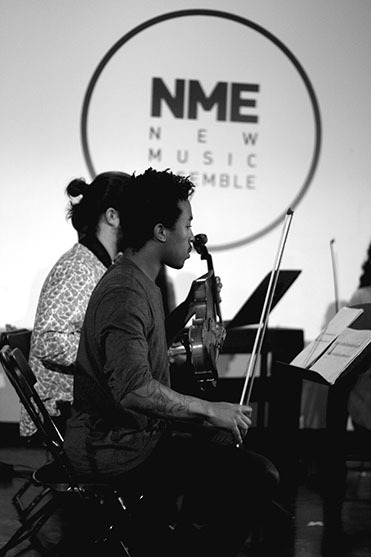 Following on the NME’s in-house concert (December 2015), the performance at Rich Mix was an outdoor trial for the ensemble’s organisational structure, which underwent radical renovation during the Summer. The collective proved its merit in providing high quality works and met with a substantial audience acclaim. Composers Sara Rodrigues, Lewis Wolstanholme and Rodrigo B. Camacho presented three of their recent major works, taking their previous aesthetic research to a higher level of compositional awareness. Rodrigues’s The Impossibility of Perpetual Motion – We’re Still Here. explored the deconstruction of musical language, with four pianists playing against the background of their own recorded voices diffused from speakers. Recordings where taken whilst they were answering questions about free-time, freedom and working in factories. Shreds of verbal texts combined with rhythmical fragments to generate an immersive performance of 8-minute length. Wolstanholme’s Four Sketches saw four couples of performers exploring the connection of sonic gestures and visual signs. Rich aural textures were created out of graphic scores of perspectival lines, black dots and cirrus-like arabesques. The outcome varied from dense mixtures of sounds through ascending crescendos (particularly in Sketch I) to sparse atmospheres where performers freely interact with each other, emerging from, and returning to, silence. On his turn, Camacho picked up the legacy of his previous flirt with live-action performances and came out with a longer version of his You have five minutes to find out where is the f***ing bomb!!! Or else… you know… all these people die. A mix of tension and energy where an emergence game turned into a process of live-sonification by performers on stage, combining instrumental extended technics with quasi-dance choreographies, aggressive actions, shouting and swearing. As everyone was invited to engage actively with the work, the NME’s experience at Rich Mix ended with an explosive break-down of established rules defining the audience/performers dichotomy. The pieces were good testaments for both the performers’ technical skills and their artistic communication, as the works required a high degree of cooperation and abilities in bottom-up approaches. The collective confirmed itself as a self-sufficient group, counting not only on versatile artists, but also on a proficient team of internal documentation and production. The members of the NME committee took care of all the stage management requirements, working alongside the video documenter Jaime Larios, the sound technician Marat Ingeldeev, and Ezra-Lloyd Jackson as the group’s official photographer. Being the first NME concert of the year, it was a hype-matching way to inaugurate a challenging 2016 that will see the ensemble performing both locally and overseas. Upcoming events include participation at John Cage commemorative event “John in a Cage” at Chalton Gallery (January 2016), performances at I’klectik Art Lab (February 2016) and the European Youth Event in Strasbourg, organised by the European Parliament (May 2016).